A poem about my experience working as the Assistant Stage Manager for The Theatre Downstream production of "Wizard of Oz". We hurry to see the cast list and find our name. With every show, it's never the same. The read through arrives and we are excited to see, what this character is going to be. The rehearsal process begins, and we become instant friends. Nobody ever wants this Journey to end. The stage managers are in for a long and wild ride. For you, you'll never know all the tears they've cried. Tech Week comes and we are stressed beyond belief. But also granted with a sigh of relief. We all know that this show will soon have an audience standing on their feet. Opening night arises and we are filled with joy. The first performance is like playing with a brand new Christmas toy. Laughter and Cheers ignite from the crowd. A truly indescribable sound. . We see this family we have formed, and realize we have become so much more. We are a team. We share the same hopes and dreams. 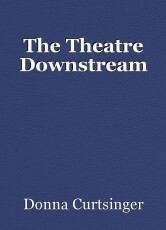 We are The Theatre Downstream. © Copyright 2019 Donna Curtsinger. All rights reserved. Great job! I enjoyed the read, keep it up! I really enjoyed reading your poem, it was fun and told about a great experience. One thing though, it looks like something's a bit off with the formatting because this is in one chunk instead of separate. It's got a lovely rhyming scheme, so it seems like there's definitely the structure for it to be separate. I work on the front of house in a theatre so I've seen a lot of the hard work that goes on behind the scenes. There's a lot more to it than people see, and the backstage crew put in a lot of hard work for it to run smoothly. It was great to read about your experience in a fun poem, it sounds like it was an amazing time. Awe! Thank you so much! I'm actually a Stage Manager myself, and I definitely agree that there is WAY more that goes into a show than people realize! Is it possible to hate your mother? When I was Daddys little girl. This page was created in 0.4886 seconds.